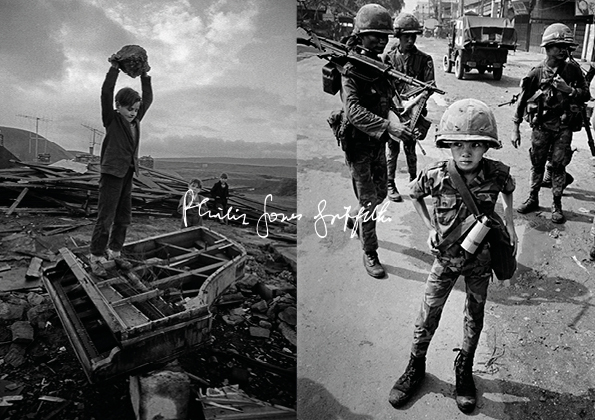 The Philip Jones Griffiths Foundation is proud to announce an exhibition by renowned photographer Philip Jones Griffiths to mark the tenth anniversary of his death, on 19th March 2008. The exhibition is presented by TJ Boulting and Trolley Books and in conjunction with Magnum Photos. PJGX presents photographs from the two important bodies of work that represent Philip’s archive – the Viet Nam war and Britain in the 1950s to 70s. It also covers several of the books that he published, from the seminal ‘Vietnam Inc’ of 1971 to ‘Recollections’, which he worked on up until the day he died in 2008. As well as his images there will be a filmed interview that Philip gave in 2007 at the University of Wales, and a recent award-winning documentary featuring interviews with John Pilger, Don McCullin and Noam Chomksy amongst others.